There’s a lot of gaming and cosplay coming up in next weekend’s convention schedule. 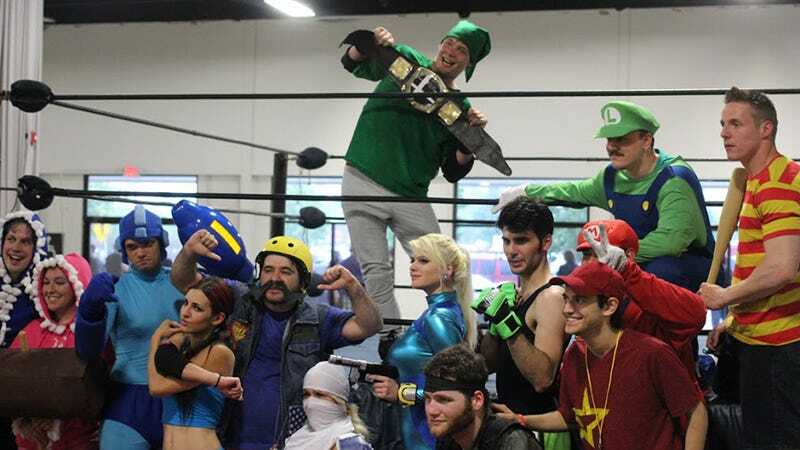 And if you’re into a cosplay-themed wrestling match (that’s what you’re looking at above), you’re in luck. We post a roundup of upcoming conventions featuring cosplay, gaming or anything we find cool every weekend. We’ve linked the websites, venues, and ticket information below. Video games, board games, tabletop games, and more are on display alongside some of their creators. Check out the convention’s special events calendar. LARPing, poker and more are scheduled during this five-day gaming convention. This is the con’s fifteenth year and will feature voice actors, authors, cosplayers and people in video games. Mighty Con is a weekend comic book show, and you can find and sell collectibles while you’re there. This con is hosted by the West Texas Anime Society and is in its third year. This con features guests, events, programming and panels, and the tickets are affordable if you want to bring the family. PrezCon is a full week of gaming, everything from board games to racing and Eurogames. Bob Layton, Walter Jones and other guests from the comic book world will be here. This two-day Doctor Who con features panels, props and photo opps. This con has a cosplay contest, panels with authors and actors, and a long list of professional guests. SoDak is the largest anime con in South Dakota. Show up for a cosplay competition, artist gallery, panels or the fashion competition. Hosting or attending a con that’s not on the list? Post it in the comments.